Cottage on Camber Sands beach! 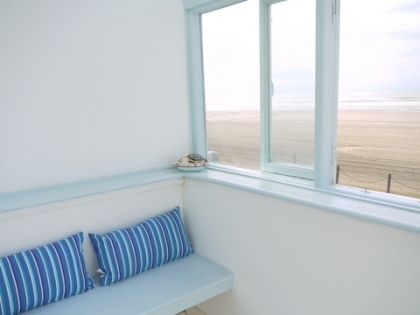 It is a wonderful holiday cottage situated right on the beach at Camber Sands! You could not get closer to the beach if you tried! The cottage is one of a short terrace of whitewashed 1930’s two storey cottages built directly on the beach. The house looks out onto Camber’s miles of sandy beach and offers a raised deck area to sit out on with steps leading down to a cordoned off area of private beach shared by the cottages. The cottages have been modernised but have kept their original feel. The bright and natural light filters in from the large glass doors overlooking the south facing beach. The cottage sleeps 6 people in the two upstairs bedrooms and a downstairs bunk room.